A crowd gathered along the shore, waving and smiling as we turned and cruised away from Henderson. I know many in these little towns will miss us as much as we will miss them. Strolling through the towns recently, I have heard many disheartened discussions about losing the Delta Queen. These river communities and the Delta Queen have become partners in preserving the treasure of small-town America. And with the Delta Queen rumbling her way into history, it somehow seems as if the entire foundation of that small-town American dream is cracking and crumbling with it. We all thought we could believe in this. The Delta Queen is the symbolic flag that flies over our battle to savor the simple pleasures of life. But that symbol is falling to the tyranny, greed, and apathy of Corporate America and Congressional Inaction. This last Delta Queen trip is providing a full range of emotions. I realize we are all going through our own stages of grief. At times I am in complete denial. Pat in the Gift Shop has already informed me that she does not want to say “Goodbye” at the end of the cruise. She says it would be more than she can bear. I also cannot imagine that in a week this onboard family will scatter to the four corners of the nation. Occasionally, I find myself simply angry at the seeming disdain and apathy of some of those who have the power to impact my livelihood and passion. Then I am afraid for the future of the members of this wonderful crew that I love so dearly. Suddenly, I am falling into an abyss of frustration, worried that my efforts are simply exhales of cold breath that will quickly dissipate and be forgotten. I am thankful that I am often in front of our cruise guests because that reminds me to put on my brave face and allow myself no other emotion than the powerful cleanser of hope. Hope. Yes, Hope. Keep Hoping. We enjoyed a stroll into lovely Henderson, KY this morning and drifted through the park which has brightened the intensity of its autumn foliage. The morning was warm in the sunshine as Laura and I held hands and meandered the streets, quiet and deserted on a Sunday morning. We stopped often to note our favorite park bench, a pretty tree, the handy library with the fast wireless internet, the quiet downtown, the quaint riverfront park with its festive fountains. Small details so often overlooked that are quickly becoming so very precious. 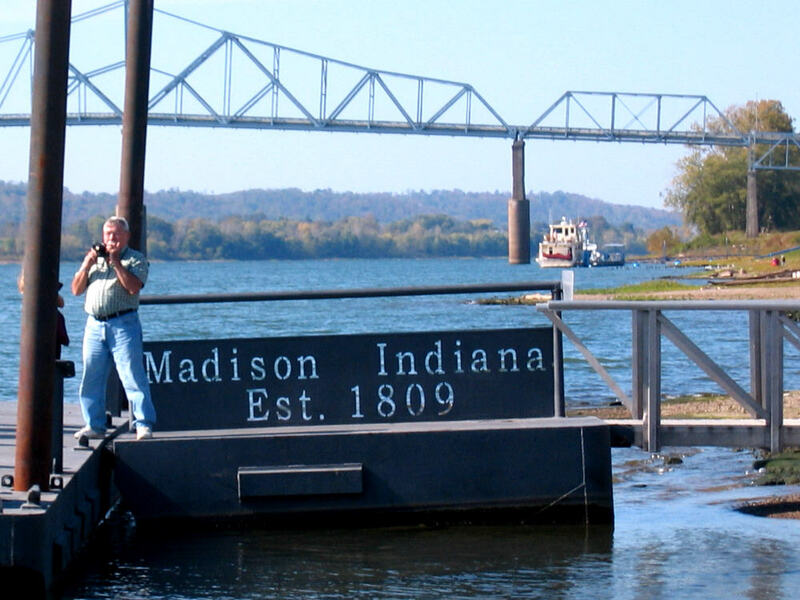 Back underway, Lewis Hankins gave a great talk about characters of the river’s early days such as George Rogers Clark, Daniel Boone, Simon Kenton, Tecumseh, and more. I also had another lecture this afternoon – this one focusing on how the rivers and steamboats were so critical to the struggle during the Civil War. Me at the Calliope in the Uniontown lock. I played the calliope as we went through another lock today. Our band pianist, Rosalinda de Leon, cannot play locks due to her claustrophobia, so I get to enjoy the opportunity to play calliope in the locks that don’t conflict with one of my events. When we have lunchtime arrivals into ports of call, I also play those as well to make sure the crowds of citizens waiting on the shore get a musical treat. I enjoy the opportunity. How often in life do you get a chance to play a steam-powered organ onboard a paddlewheel steamboat? You’ve got to savor those moments! The evening show was a special treat. Cindy Chengery (Captain Gabe’s lovely wife) met Gabe when she was a performer on the Mississippi Queen. She delighted audiences on the American Queen and Delta Queen for years. Since the Chengerys are riding as passengers this cruise, Cindy was persuaded to bring her charts and perform. She has a wonderful, warm voice and is such fun onstage. What a pro! It was a treat for us all. and click on the “Delta Queen Dethroned” featured video icon. More to come, have to run back to the boat! After leaving Madison at 2:30pm yesterday, we skimmed downstream enjoying a magnificently clear and bright autumn day. The banks were dotted with adorable towns and rolling hillsides brushed delicately with gentle fall pastels. Guest lecturer Jerry Sutphin (writer and producer of the Delta Queen documentary “Tested by Time”) delighted guests with his lecture and slides about the boat’s history. 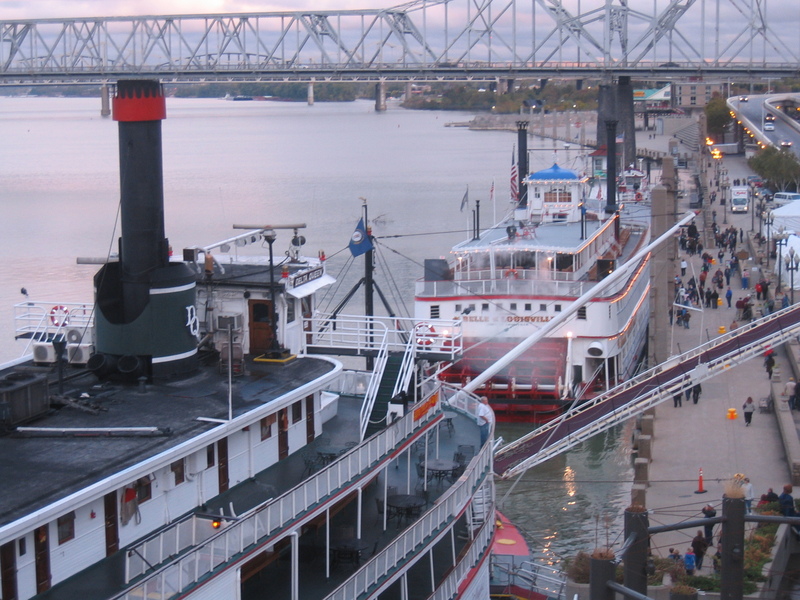 We pulled into Louisville, KY around 8pm last night and docked next to the Belle of Louisville. Laura Sable presented her incredible “Great Ladies of Song” show to great acclaim. Afterward the band played for dancing and Phyllis Dale wound up a rowdy crowd with her performance in the Texas Lounge. As they completed their duties, some of the Delta Queen crew slipped ashore for a crew party at a local bowling alley. After enjoying some of Phyllis’ shenanigans, Laura and I went up the hill to join the crew. It was a festive night of warm feelings as everyone danced around the realization that our days together on the river are drawing to a close. Morning arrived accompanied by a cold front and rain. This was especially disappointing as we had planned a special Tribute Event for Louisville to be held on the Delta Queen’s Texas Deck bow. In response, the Belle of Louisville folks also had planned a riverfront party. With the rain hurling down in sheets, we all met early this morning to brainstorm “plan B” ideas. In order to keep attendees out of the rain, the Belle folks kindly offered to let us hold the event in the Belle of Louisville’s cavernous second deck – even though it would pose great logistical difficulties for them to clean and reset for their evening cruise. Miraculously, about a half-hour before the event, the front pushed through, breaking the clouds apart until the sun gleamed off the freshly rinsed boats and riverfront. Our prayers had been answered! 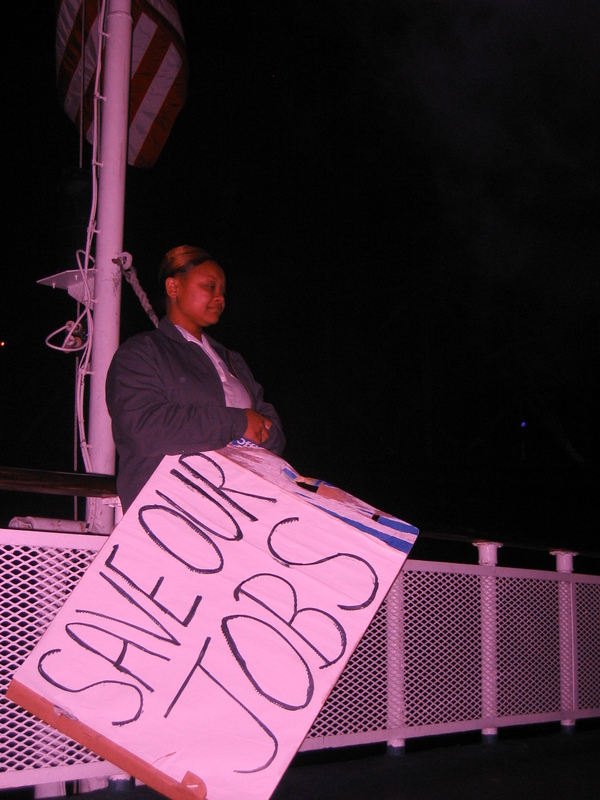 “Plan C” was quickly reconfigured to hold the event on the landing in front of the Delta Queen. It couldn’t have worked out better. 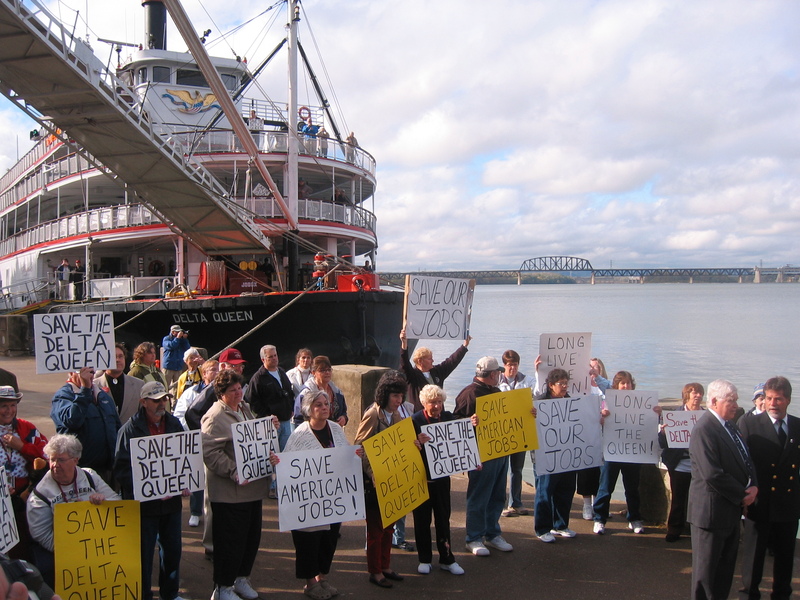 All the local TV stations covered the event with the speeches and presentations back-dropped by the Delta Queen with a passionate crowd of supporters sporting an array of “Save the Delta Queen” themed posters. It will make a lovely and powerful image on the area news. I was honored to make remarks on behalf of the Delta Queen. Louisville Mayor Jerry Abramson shared warm sentiments. Additional support was shared by Belle of Louisville Executive Director Linda Harris and Mike Barry from the Kentucky Derby Festival. Delta Queen Captain John Dugger presented the mayor with a commemorative plaque. 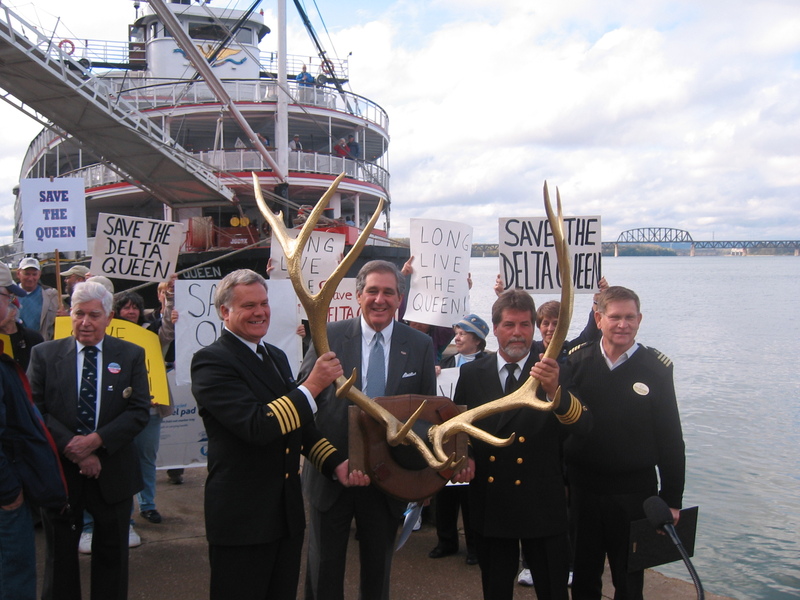 Allowing the Belle to "hold" the Delta Queen's Steamboat Race trophy antlers until we can return. 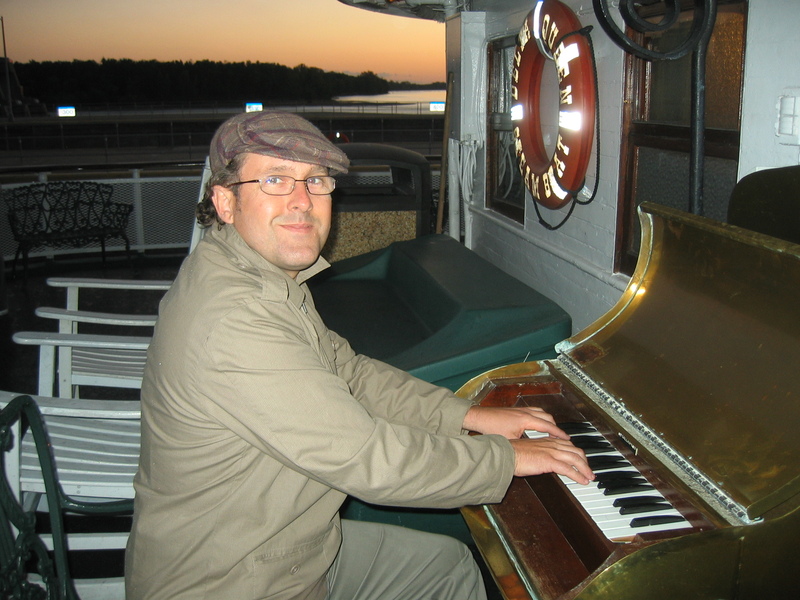 After the event, Travis Vasconcelos presented a fantastic concert on the Delta Queen’s steam calliope. Travis hails from Louisville and has previously worked as a calliopist and lecturer onboard the Belle and the Delta Queen. Travis is a calliopist extraordinaire. 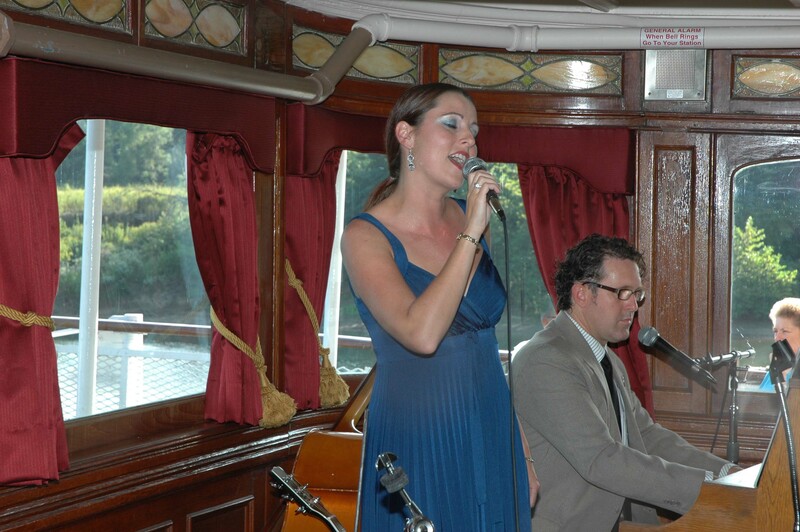 I must say in the more than a decade I have spent aboard riverboats, I have heard many wonderful calliopists. But I do here honestly and openly declare that I have never experienced the skill, flair, daring displays of dexterity and cunning keyboard craftsmanship exhibited by Travis. He is the best there is. And he was apparently moved by the historical significance of the occasion to present perhaps the most astounding calliope musical razzmatazz that has ever been undertaken by a mere mortal. Wow! I wish I had videoed to be able to share it with you, dear Reader, but I simply stood transfixed in sheer delight and awe. With the rain subsided, the Belle of Louisville’s riverfront festival proceeded as planned. We took a stroll, visited with old friends along the waterfront, tasted some barbeque, and enjoyed the band. As the Delta Queen departed with Captain Gabe Chengery playing “My Old Kentucky Home” on the Calliope, the Belle of Louisville lined up beside us in much the same fashion that the great race begins each year. The Belle of Louisville was previously named the Avalon and as both boats proceeded upriver side by side, Captain Gabe played “Avalon” as a touching and fitting tribute. 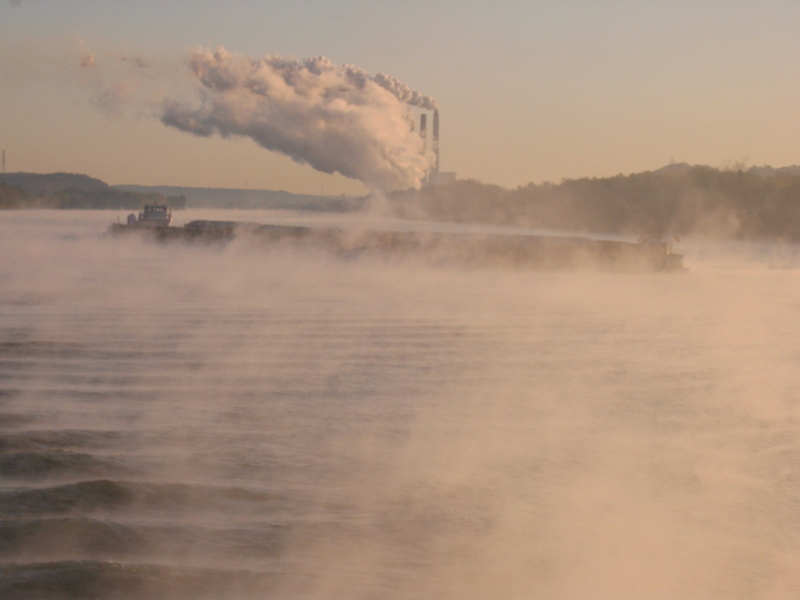 The two oldest steamboats, paddled side by side, whispering to each other of the memories they had shared and marking their final moments of history together. Cabin attendant Theresa savors the sounds of the calliope with a full heart. There were not many dry eyes remaining. Out of sheer courtesy and good manners, the Delta Queen slowed up to allow the Belle the blissful feeling of pushing ahead in the lead (a sensation they have not experienced in a long time!). The Belle continued on upriver as the Delta Queen swung around and made her way back downstream. Captain Gabe headed off to his dinner and I took over at the calliope to toss out another musical treat in appreciation to the crowd that still lingered along the shore to soak in every last droplet of riverboat bliss before the Delta Queen disappeared into the canal and headed down toward the lock chamber at McAlpine lock and dam. I had been in full motion since early in the morning. It was a day that lasted forever. For me it will remain a day that I hope will last forever in my memories. A tow boat in the morning fog. The morning sun whittles away the mysterious fog. 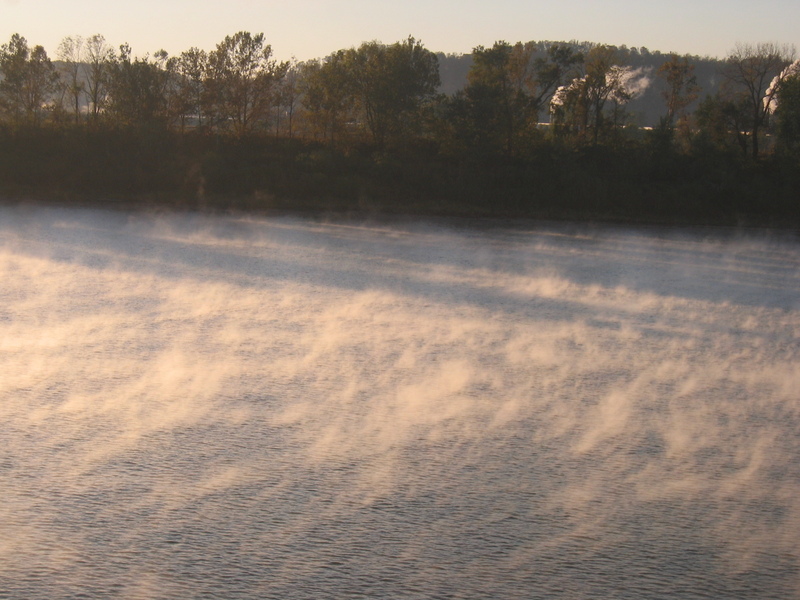 Coming downriver from Maysville, KY to Madison, IN we ran into some fog which slowed us down. With 150 miles to travel and two locks to pass through, it would have been a miracle to have made the scheduled 8am arrival. With the fog, we didn’t stand a chance. We finally arrived in Madison around 11am to give the guests a chance to stroll the 133 blocks on the National Register of Historic Places. This is one of the prettiest towns along the river and always a delight to visit. We snuck away to the coffee shop for good coffee and internet. We then snuck over for one last indulgence in the incredible burgers at Shipley’s Tavern which dates back to 1867. Visiting river towns frequently over the years, I have somehow developed a special attachment to a few. Madison, Indiana is one of those “extra-special” ports and I will miss strolling it’s quaint streets. 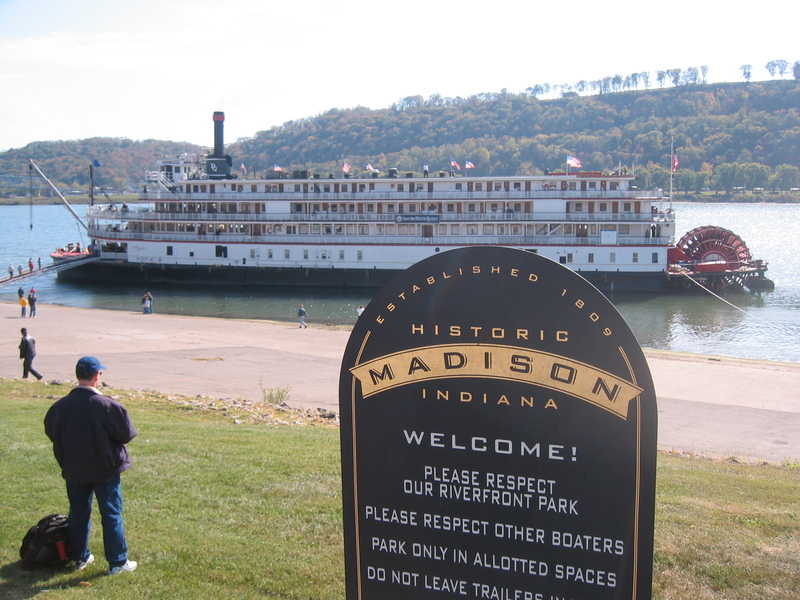 After a lovely, but breezy morning of cruising down the Ohio River, we arrived into cozy, little Grandview, IN, near where Abraham Lincoln spent some of his youth. The current and the wind were both so strong, it took more than an hour to get the boat docked and secure for the guests to go ashore. I enjoyed an afternoon to work on these blog entries and read (I highly recommend “River of Doubt” about Teddy Roosevelts amazing journey through the Amazonian rain forest) as I waited to meet with area reporters and photoagraphers. Laura and I performing in the Texas Lounge. Laura and I were scheduled for the afternoon set in the Texas Lounge and had a lovely time performing for a festive group. Last night was the “jazz buffet” dinner with Bobby Durham’s Riverboat Rhythm adding festive music to the special dinner. Mark Twain on the Delta Queen. 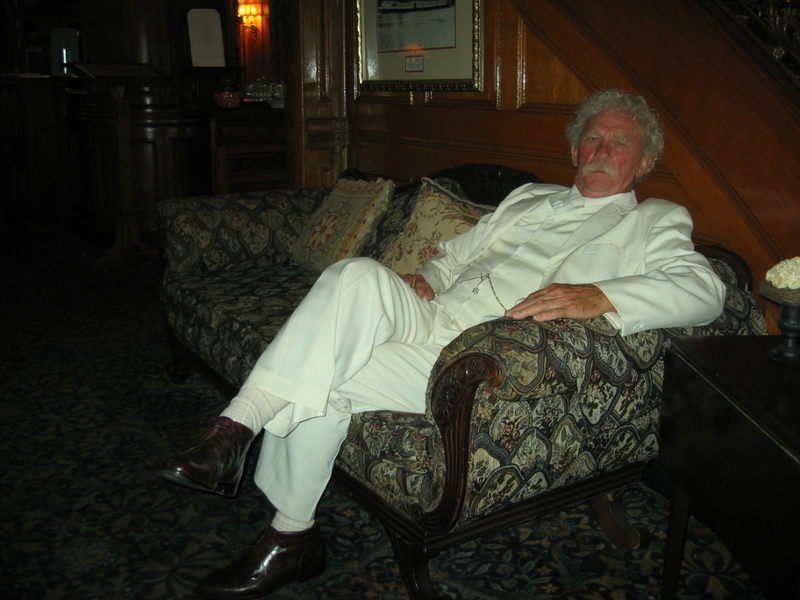 Lewis Hankins joined us yesterday and tonight performed as Mark Twain in his wonderful show. He embodies and seems to almost channel the spirit of Twain. 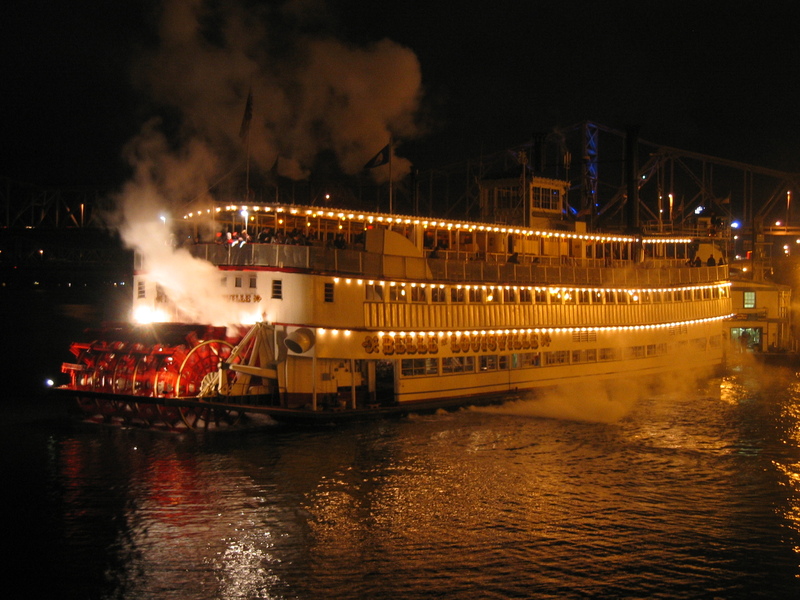 There is little as perfectly magical as enjoying a Mark Twain show onboard a steam-powered paddlewheeler churning along the river!